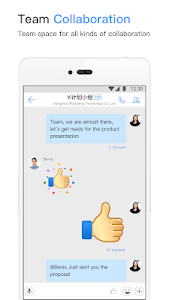 DingTalk, an App by Alibaba, is a free communication and collaboration platform used by over 7 millions of enterprises or organizations around the world, including Alibaba Group, Alipay, Lazada and Alicloud. # Enterprise address book. Support to setup and manage all employee profiles with organization structure information in DingTalk. View the organization structure at a glance. 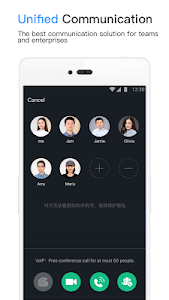 Find co-workers at ease, no need to save phone numbers. # Unified communication. One-touch video/voice conference calling. High quality internet voice call (VoIP) and easy to use. # Instant Messages with notification features. 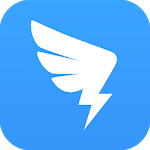 Easy to setup mobile workspace for group chat and collaboration. All files and pictures shared in group could sync to cloud and easily be tracked in folders by order. Important messages can be converted to notification sent by in-app, SMS or even phone call. 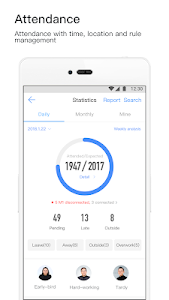 # Free attendance management and mobile approval. 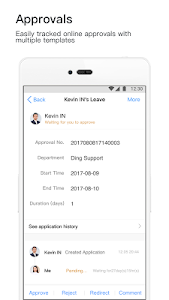 Support mobile clock-in and fixed/free/shift attendance management with mobile leave approval. With powerful workflow engine support, you can customize your own or preloaded templates and approval chain. # Task and calendar management. Create, assign, and tracking tasks easily with task management features. 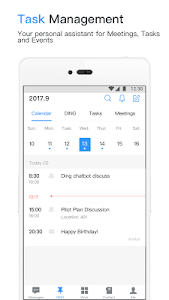 Unified calendar view help you manage all your tasks, meetings and events easily. This update includes bug fixes and user interface improvements.